There’s a little gambling going on right now in an obscure coastal stream in Mendocino County, California, called Pudding Creek. No one is throwing dice or yanking on a one-armed bandit here. We are talking habitat restoration. And the habitat restoration game always involves a bet. Trout Unlimited, a landowner, a timber management company, resource agencies and various watershed restoration experts are working together to restore habitat for coho salmon and north coastal steelhead in Pudding Creek, which connects to the ocean just north of the community of Fort Bragg. The bet is that placing logs into this stream—in effect, trying to replicate conditions before people began extensive logging in this region more than a century ago—will result in a significant boost in numbers of returning coho. Photo: TU's North Coast Coho Project staff Lisa Bolton and Anna Halligan bracket staff for Assemblymember Jim Wood and Rep. Jared Huffman on a recent tour of the Pudding Creek BACI project. Large pieces of wood (okay, sometime entire trees), when slotted into a stream at different angles, can quickly create more complexity of habitat, such as scour pools, undercut banks, and gravel beds, for fish. Such structure provides shelter and helps keep water temperatures cool, too. The Pudding Creek project utilizes standard timber harvest equipment to place logs into the stream channel. The importance of the Pudding Creek restoration project goes well beyond the short length (<10 miles) of this stream. At present, Pudding Creek has the highest numbers of coho of any stream in Mendocino County, but no one can say exactly why. 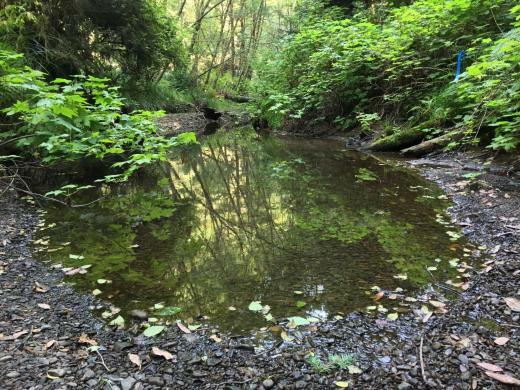 There is cautious optimism that the current large wood project will act as a multiplier to whatever conditions in the drainage are promoting coho success. Coho salmon are on the ragged edge of extinction in California, and are listed as endangered under the federal Endangered Species Act. The southernmost runs of “silvers” in the Pacific Northwest need all the help they can get. The “construction” phase of the Pudding Creek project concluded in mid-August, 2015. All told, some 400 pieces of large wood structure were placed at strategic angles into the stream over 80 percent (7.5 miles) of the drainage. This should be enough “treatment” to prompt an observable change in fish numbers. And the project partners will conduct intensive monitoring for a number of years after the implementation phase is concluded to record results. The concepts of this experiment have been tested successfully further north (in Washington), but have never been fully vetted in California. That’s why the Pudding Creek project is a double-down bet. All the key elements are in place—over a decade of pre-treatment data on salmon population, a robust design for monitoring whole life history and both biological and physiological effects, proven “wood treatment” tactics, a strong public-private partnership—to tell us whether large wood installation will help deliver a better return on future restoration investments from Santa Cruz to the Oregon border. 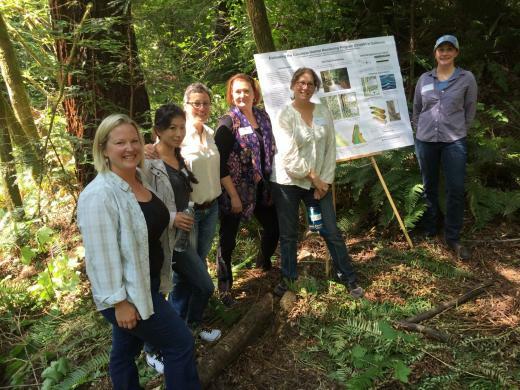 Trout Unlimited, through our North Coast Coho Project, is the Pudding Creek project administrator and grant manager. The California Department of Fish and Wildlife, The Nature Conservancy, and NOAA/National Marine Fisheries Service provided major funding for the project. Other key partners are Hawthorne Timber Company, Campbell Global, the Pacific States Marine Fisheries Commission, Pacific Inland, Inc., and Blencowe Watershed Management. TU is committed to doing whatever it takes to bring coho and steelhead populations back to viable levels in the beautiful waters in this region. And we are willing to bet that the combination of strong science, exceptional partners, and innovative strategies we are bringing to bear on Pudding Creek will pay off for fish—as they have in dozens of other TU-led restoration projects in this part of the world. Photo above: Pudding Creek still has water, at the height of the summer after four years of drought.